The son of Hugh and Agnes Mitchell, Alex Mitchell was born in Stirling on 2nd April 1941, but grew up in Glasgow along with his older sister Jeanette and younger brother Hugh. At school, Alex excelled in the technical subjects, but when he was 14 years of age and looking for ways to earn some pocket money, a family friend by the name of Mr Tommy Paul opened a butcher's shop in Barrhead. That shop was nothing like Alex's own shop nowadays, since Mr Paul's shop had no refrigerated counters. In 1957 Mr Paul offered Alex, who was by then 15 years old, a full time job earning a weekly wage of £2.50, much to Alex's technical teacher Mr Patterson's disappointment. Just like any trainee butcher today, that job involved making the sausages and washing up. He then progressed onto the Steak Deck, where he handled Sirloin Steaks, Popeseye, Rib Roast, Rump Steak and Shoulder Steak. Most steaks were cut as required. They all had to be cut straight and no knife marks were to be seen otherwise Mr Paul would reprimand the young butchers. That usually involved a swift kick to the ankles! Having mastered the steaks, Alex then progressed further on to the chops and to window dressing, something which Alex is proud of and well known for in his own shop still to this day. Despite being good at the job, at the age of 17 Alex informed his mother that he did not like his job and wanted to leave it. She was not happy at all about that news and 'encouraged' him to stay in the job, since people would "always want to eat meat". In those days, youngsters commenced their apprenticeships at the age of 16, so Alex was actually then too old to become an apprentice. He decided that if he had to stick at the trade, then he was determined to do well in it. So, he then started to attend evening classes three nights per week at the Allen Glen School. In 1962, after fours years of study and at the age of 21 having passed all his exams Alex received his diploma. After graduating from evening classes and when he was newly engaged to Margaret Menzies, Alex asked Mr Paul for a pay rise so that he would then earn the same as his colleague Jack Kelly. However, Mr Paul refused, so Alex left his employment there to move on to a much larger company called Stewart Brothers of Partick, Glasgow. There, he worked with Edward Stewart and despite thinking that he knew it all, especially with his newly gained qualification, it was only then that Alex's education in the butchery trade really began. away telling them to retray the items. Later on, after Mr Stewart had passed away and Mary had retired, a chap by the name of Mr Alex Barber came to manage the shop. He didn't say very much, but if the butchers' workmanship did not meet his standards, he would also send the butchers away to re-tray their steaks and chops, or re-hang the joints correctly in the shop window. Always keen to learn and improve his own butchery skills, Alex would carefully observe the other butchers and picked up lots of good tips. At the tender age of just 23, Alex married his beloved Margaret at St James' Parish Church in Pollok, Glasgow on the 5th September 1964. The ceremony was conducted by the Rev James Currie. Alex moved on from Stewart Brothers to take up a position for Allied Suppliers as the manager of their first supermarket in Oswald Street, Glasgow. They had taken over the Galbraith store. Alex recalls an incident that happened there after he caught some of his staff hiding meat in the dirt bins. When he challenged them, one of them threw a meat cleaver at Alex, which fortunately missed him but destroyed a sky light. They left, but threatened Alex by telling him they'd see him in the morning. Alex reported the incident to his supervisor, who met with him the following morning ready for the thieving staff members. Sure enough, they were waiting for Alex at the shop door in the morning ready for fisticuffs. Hands came out of pockets and glasses were removed in readiness for what might have happened, but fortunately the supervisor intervened and was able to calm the situation down. They were removed from their positions and replaced with new staff. Littlewoods in Scotland. Alex applied for the position and was offered the job. After discussing the offer with Margaret and other family members, Alex accepted. There was indeed a great deal of travelling involved in this new role. Whilst still living in Glasgow, Alex drove around the stores within his East Coast region improving business efficiency and procedures. He was working very long hours, but Alex really enjoyed his job and the challenges that it presented to him. In 1968, Alex and Margaret made the decision to relocate to the new town of Glenrothes in Fife on the East Coast of Scotland, which was much better located for the amount of travelling that Alex was doing. At that time, Littlewoods decided to open a store in Dundee and Alex was given the challenge of recruiting the required staff. The Dundee store became Alex's central store when he wasn't travelling around the region. He, and the rest of the management team, worked very hard at building up that store, which soon became the busiest store in Scotland. This was a great achievement, and something that Alex is still very proud of. On 2nd December 1970, Alex and Margaret became the very proud parents to their first and only child, Katherine. Alex was still travelling a great deal, and had to rush through to Glasgow, where Katherine was born, to be with Margaret and their new baby girl. In 1974, the travelling was getting too much for Alex because he wasn't seeing Katherine as often as he would have liked. Littlewoods job, Alex was missing out on seeing his family, so he decided to apply for the manager's job with Alex Munro. He was offered the position, but he was to be based in their shop at the Kirkcaldy Mercat Centre. the shop to become one of the top five stores in Scotland. butchery competitions. He won The Master Butcher of the Year competition in 1977, and in 1986 he was crowned The Master Poultryman of the Year. Alex was now becoming a very well-known character within Glenrothes and the surrounding areas with a reputation for being an exceptional butcher. When Alex and Margaret were courting' way back in the day, they had hoped that, one day, they might own their own house and perhaps even own their own business, too. well-respected, and award-winning business that it is known for today. Throughout his career, from the moment he decided to actively pursue a careerin the butcher industry, Alex has had a real passion for his work and has been committed to achieving excellence. 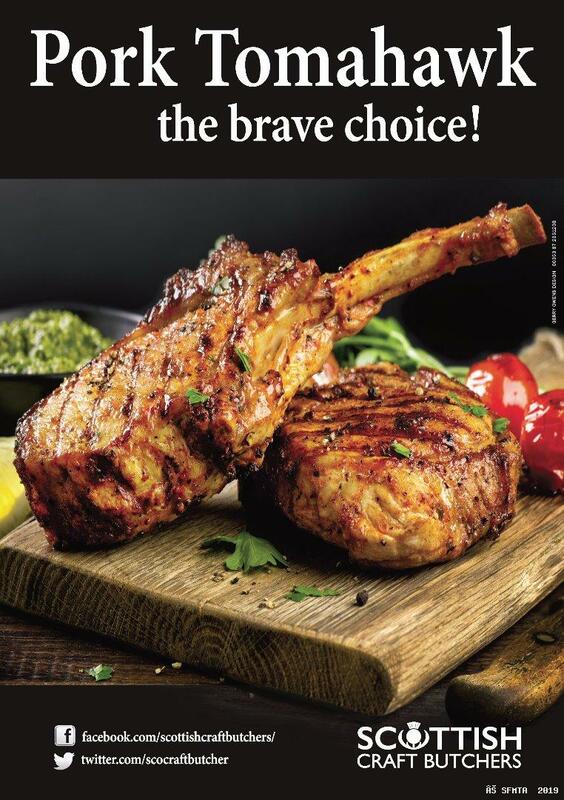 His reputation as being a bit of a stickler for extremely high standards is well-known, which past and present Alex Mitchell Butchers staff members will no doubt testify to. effectively became multiple shops allowing customers throughout the length and breadth of Great Britain to also have access to the high quality Alex Mitchell Butchers' fresh Scottish Meat produce including the fabulous Aberdeenshire Scotch Beef that so many customers are used to at The Glamis Centre. passionately pursued over the years. Poultry, Locally Sourced Venison and lots of other delicious products. staff as they have joined with him in the pursuit of achieving excellence. Some of them have gone on to open their own businesses including Andrew Kirk of Andrew Kirk Butchers, Fife. Some of them have even gone on to marry his daughter, Katherine, having started out as the dishwasher! In addition to customers, suppliers and staff members, Alex would also like to thank The Scottish Federation of Meat Traders Association (SFMTA) and Quality Meat Scotland (QMS) for their invaluable level of support for his business. As a Christian, Alex is grateful to God for the love and guidance that he has experienced over the years. There have been some good times as well as some trials during Alex's career, and he is thankful that God has seen him through those times with the promise that He would never leave nor forsake Alex. Finally, Alex would like to thank his family for their love and support that they have given him over his lifetime and career. Margaret has been a loving, faithful and devoted wife to Alex, also being his business partner as they strived together to develop the Alex Munro store, then subsequently the Alex Mitchell Butchers business. Katherine, Alex and Margaret's daughter, came into the business in a formal capacity in 2008 and is growing the business in various ways, along with her husband Paul, including the bakery and online departments. 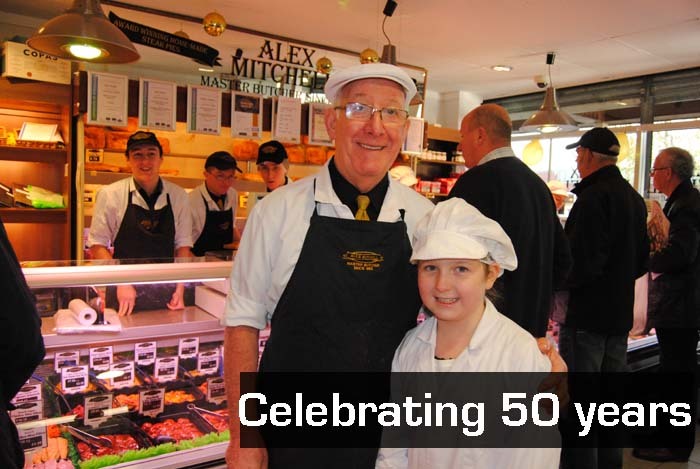 So, as Alex is celebrating an amazing 50 years as a Master Butcher, it is clearly evident that he has had, and is still very much enjoying to this day, a very lengthy, distinguished and successful career, and is a highly regarded figure within the Scottish Butchery Industry.